A bit of tradition with fresh energy. 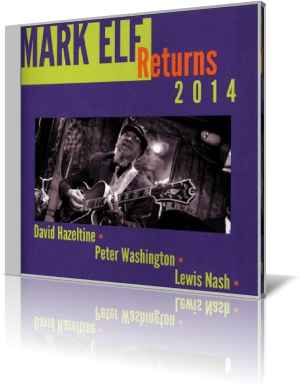 That’s what the listener gets with guitarist Mark Elf’s Mark Elf Returns 2014 (Jen Bay Records, 2014). Elf’s “A Little Diddy” opens the set. The title is apt as the music represents an artist not deliberately trying to make a statement, but instead just wanting to have fun playing. The quartet is well in sync, each musician complementing the others. Elf leads most of the way, performing in a way not unlike Wes Montgomery, or perhaps Lee Ritenour honoring Wes Montgomery. Then Hazeltine tickles the ivory, accented by Nash’s staccato rolls. What follows is an alternating call and response, Elf-Nash then Hazeltine-Nash, back and forth before the group reverts to the melody. A melody without fills as the foursome stops when Elf completes the main phrase, pauses, then does it again. A very nice diddy indeed. “Michelle’s Mambo,” another Elf original, is a tasty, get those feet moving piece. It conjures images of an island beach with tiki torches framing the sandy dance floor, and all the spectators enjoying tropical drinks. Elf stretches out aplenty, while his accompanists are firmly locked in. Contributions by Nash and Kroon are notable. The song is written for Elf’s youngest sister, who died in 2010. Another reason for the delay of this release is cost. Elf learned of the web site that helps artists raise money, www.kickstarter.com, and was able to raise funds to produce Mark Elf Returns 2014. It was well worth the effort, as Elf and his sidemen are superb throughout.